The Glacier T708 has been discontinued. No direct replacement is available. 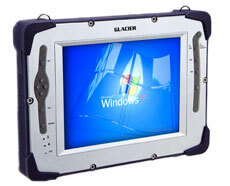 Ideal computing solution for data collection in an outdoor environment. Built rugged from the inside out, the T708 is the perfect mobile solution for repair service, construction, utility, waste management, and other field technology personnel. The T708 rugged tablet is designed for a rugged environment with compact features, wireless communications, GPS and optional sunlight readable display. A rugged vehicle cradle provides additional IO, keyboard integration, and DC/DC conversion. Intel Atom N450 Low Power 1.66GHz CPU, Windows XP Pro, 1 GB DDR2 RAM, SATA 160 Hard Disk, Sunlight Readable 8.4" TFT display, Wi-Fi (802.11a/b/g/n), Bluetooth, CDMA 3G, GPS, 1.3M Camera (front), 3M Camera (rear).